All-Star Aaron Nola will try to pitch the Philadelphia Phillies to a series sweep on Sunday afternoon. Nola and the Phillies face the Miami Marlins in the finale of a four-game set at Citizens Bank Park. Right-hander Dan Straily will take the mound for the Marlins. The Phillies (62-48) have won four games in a row and they'll try to get to 15 games above .500 for the first time this year. They own a 1 1/2-game lead in the National League East over the Atlanta Braves, who were shut out by the New York Mets on Saturday. Nola (12-3, 2.35 ERA) has not won since July 9, but he was stellar in his last start against the top offense in baseball. Nola threw eight innings against the Boston Red Sox last Monday, giving up four hits and one run, which was scored because of a misjudged fly ball. 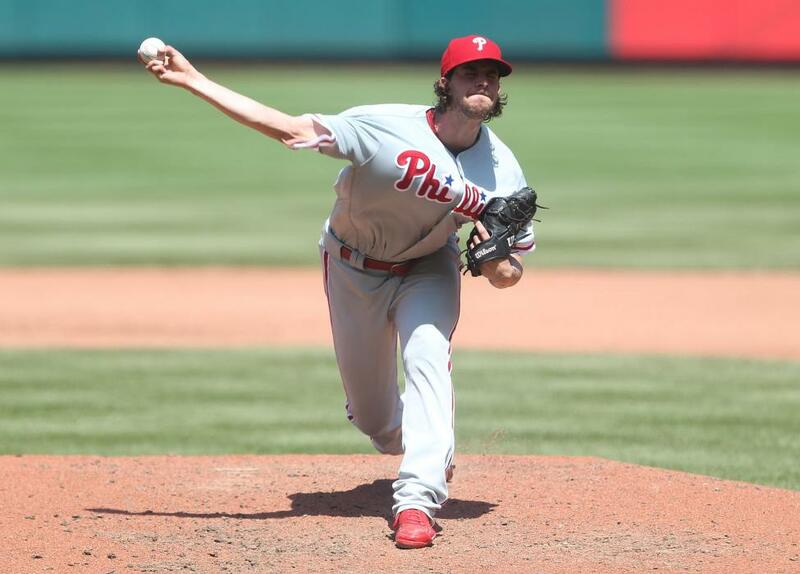 The right-hander had six strikeouts at Fenway Park, but the Phillies lost 2-1 in 13 innings. "It was probably the pitching performance of the year," Phillies manager Gabe Kapler told MLB.com after the outing. "From the beginning to the end, when he came out of the game, he was sharp with all of his pitches. "And, in fact, there were times in his last inning of work where I thought his ball had some of the best life that it had in the entire game. He landed his breaking ball at will. He essentially controlled everything he could possibly control. He deserved a better outcome." Nola has allowed one earned run or fewer in 12 of his 22 starts this season. [post_ads]He shut out the Marlins over 7 1/3 innings on May 2, and allowed Miami two runs in six innings on July 14, getting the win in the former and suffering a loss in the latter. He is 3-4 with a 3.79 ERA and 1.079 WHIP in nine career games against the Marlins. Straily (4-5, 4.41) is pitching in the series finale for Miami after the team bumped left-hander Wei-Yin Chen to start Monday at home against the St. Louis Cardinals. Chen has a 2.18 ERA in eight home starts and a 10.27 ERA in nine games away from Marlins Park. Straily also struggled away from home in his last start. He gave up eight runs (five earned) and 11 hits in just 3 2/3 innings against the Atlanta Braves on Tuesday. "I just didn't have it today. Plain and simple," Straily said to MLB.com. "I didn't have location, I didn't have stuff. Everything they put in play today found a hole. It just wasn't my day out there." Straily, 29, gave up four runs in four innings against the Phillies on April 30 in his 2018 debut. He is 4-2 with a 5.73 ERA and has 43 strikeouts in 37 2/3 innings in seven career starts against Philadelphia. Phillies infielder Asdrubal Cabrera is 4-for-14 with a homer in his career against Straily. Cabrera hit a two-run homer on Saturday, his 19th of the season and his first since joining the Phillies via a trade in late July.